New - Special edition print offer! Now available for a limited time at a special price! Original special edition photographic prints. For nearly half the price of a limited edition original print, these prints are made by Lynn Radeka using the same exacting standards and attention to detail as his higher priced limited edition prints. The image currently offered is made using a series of masks described in the Contrast Masking Kit. 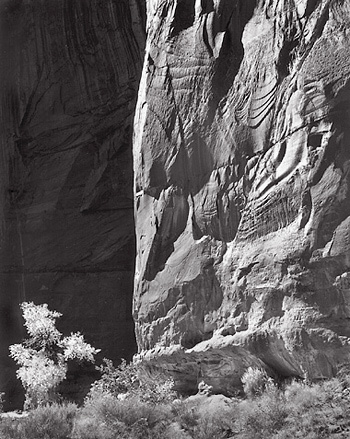 Horseshoe Canyon, by Lynn Radeka, utilizes a Highlight Mask, a Shadow Contrast Increase Mask and a Fog Mask. The end result is an image which reveals remarkably crisp detail and contrast throughout the entire tonal scale with brilliant whites and rich detailed shadows. It serves as an excellent example of using effective masking techniques to create an image with clear and delicate values, from shadows to highlights. This print is available for a special discounted price of $300 (a discount of $100 off the normal edition price) for a limited time only. When ordered with a complete Precision Pin-Registration Carrier System (either clear glass OR ANR glass version), the special discounted price is only $150 for the print (a full $250 off the normal edition price!). Each print is meticulously prepared by Lynn himself, mounted on 14" x 18" acid-free white museum board with matching bevel-cut overmat - ready for framing and display, and signed on the front. Each print is numbered on the back, with the number followed by the letter "S" - denoting special edition. The numbering sequence for this special edition is from 101S to 200S. Prints are available on a first come, first served basis. The special edition is separate from the original limited edition of 1 through 100 for this image. Print size is approximately 9" x 11". When ordered with the complete Precision Carrier System, the print will be shipped without an additional shipping fee in the USA (you'll still have to pay the usual shipping fee for the carrier system) in a separate package, and may take an additional 2 to 3 weeks for delivery. A shipping fee of $60 will be applied if shipped out of the USA. Shipping cost: Special edition print (if purchased separately) - $15 within USA, $60 outside USA.